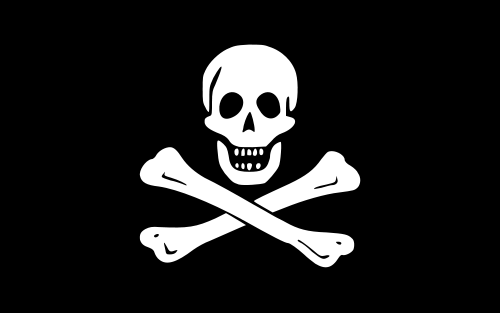 Outside of Germany, no one seems to have noticed the extraordinary efflorescence of a new party, Die Piraten, the Pirate Party. (Also, no one seems to have noticed that the German word PARTEI — political party — is an anagram of PIRATE.) It’s an international movement, of course, and I suppose it started in Sweden, with links to the Pirate Bay file-sharing site. As with many such political movements — fascism and the Green movement are just two examples — Germany has proved a particularly fertile ground, and the most recent state elections in Nordrhein-Westfalen found the Pirates winning 7.8% of the votes, nearly as many as the liberal FDP. Interestingly, that vote has drawn quite a bit of attention in the foreign press for its undermining the ruling coalition, but no one outside of Germany is talking about the Pirates. There is a long tradition, going back to Cicero — and continuing through Gilbert and Sullivan — of invoking pirates as an ironic commentary on rapacious rulers, extended to rapacious capitalists by Bertolt Brecht and others. The association of piracy with illegal copying of artistic works goes back to the 17th century in England, as I learned from Adrian Johns’s magisterial book Piracy rights, where I also learned that the earliest designation of copying as piracy did not describe neglect of an author’s right to earn a living from his work (which right was nonexistent), but rather neglect of the king’s right to censor. A pirate was not someone who stole a poor scribbler’s hard-fought text, but rather one who arrogated to himself permission to publish without royal license. More recently, pirate radio expressed the opposition between piracy and censorship. I find myself enormously encouraged by this movement. Their stated goals are ones I generally support: reform of intellectual property laws, data protection, civil rights and government transparency. But there’s not enough there to really make up a political program. I see it in generational terms. It may not be true that all property is theft, but it certainly seems that those who got into the world before us have gone out of their way to make sure that everything that exists has been carved up and allocated to owners, up to and including the land, the sea, their ideas, their music, and their genetic code. Pirates: Strengthen education. Understand Physics. Here’s an election campaign poster of the Piraten in NRW. The Greens on top with one of their solemn eco posters: Windmills and the slogan “Every source of power needs a driving force” (approximately), and then “Green makes the difference.” What does it mean? Damned if I know, but it sounds green! Some political commentators have suggested that the recent near-meltdown of JP Morgan Chase because of inability to cover its gambling debts might prove uncomfortable for Mitt Romney, who seeks the repeal of the Dodd-Frank law, that would likely have forbidden the gambles that the bank lost all the money with. How unimaginative! Surely, this is just one more example of how the Democrats, by attempting to rein in dangerous practices in the finance industry, are simply rewarding their Wall Street paymasters, while Romney is the lonely voice of equity (private), allowing the fat cats to suffer the consequences of their malfeasance. I’ve been increasingly interested in the outsized role played by finance in the running of the modern world, and the role of mathematicians in intellectually laundering the financiers’ money. The most interesting (and chilling) book I’ve read in quite a while is Nicholas Shaxson’s Treasure Islands, a thorough investigation of the scope and method, nearly incomprehensible to outsiders, of tax havens and the global network of secrecy jurisdictions. Much of the otherwise impenetrable nature of British politics makes vastly more sense when one understands that the British Empire did not disappear, but was transformed into a network of shell countries centred on the City of London, whose vast financial power makes the paltry debates at Westminster nearly irrelevant (when the interests of the bankers and their clients are affected). Among the more minor but astonishing revelations is that the City of London — effectively, the representative of British finance on Earth — has its own representative in the House of Commons, the “City remembrancer”, a lobbyist for finance who is officially seated behind the Speaker’s chair (and has been since 1571). The City itself is exempt from many acts of Parliament and is outside the purview of the elected mayor of London, and its own self-government, the Corporation of the City of London, is selected almost entirely by the representatives of large banks. And now the US seems on the verge of electing as president, not a Manchurian candidate, but a Caymans candidate, someone who is heart and soul part of of the international plutocracy, with his own funds stashed in the Cayman Islands and Switzerland. I am genuinely disturbed by this prospect. My own comments on mathematical finance may be found here.